This book is for drafters of Mergers & Acquisitions (M&A) contracts. It provides an overview of purchase price adjustment tools, manipulation issues, purchase price calculation standards and the inter-relationship of such clauses. Chapter 2 discusses the basics of M&A, such as the scope of definition for M&A, and the different motives and phases during the M&A process. Chapter 3 provides a brief introduction into company valuation methods. Various valuation methods are involved in purchase price adjustment issues, hence it is essential to know their components to obviate manipulation potentials. In chapter 4, various guarantees are highlighted where its breaches can also result in purchase price adjustment. Discussion focuses on the guarantees under German law, which have different impacts depending on the magnitude. An ambiguously drafted clause can have the surprising opposite effect desired by the parties. This leads to one of the central themes of the paper; precise formulation of clauses is the foundation for good contract drafting as it reduces potential future disputes. The main chapter of this book is chapter 5 where the two tools which directly influence the purchase price will be discussed: retrospective purchase price adjustments (post-closing adjustments) and future-oriented purchase price adjustments (earn-outs). The differences, advantages and disadvantages for both parties, the appropriate metric, manipulation issues and the calculation of the purchase price adjustment will be covered to guide the drafter of common foreseeable problems. Chapter 6 provides a brief introduction to issues which can arise relating to dispute resolution, which are common avenues in international M&A transactions as arbitration does not necessary always follow the set international rules. 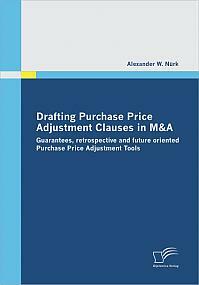 Other clauses in an M&A contract also have influence indirectly, on the purchase price, so chapter 7 covers the matter of coordination of purchase price influencing clauses.